Smart build and modern retro vibe: hugely rock ’n’ roll power, single-coil voice. No gigbag or lefty option available; not cheap. 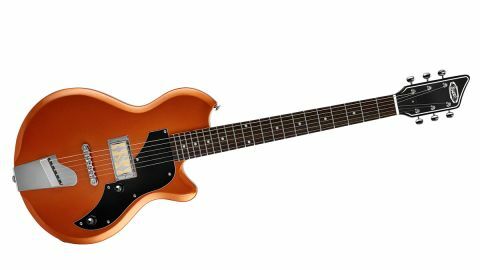 To kick off 2017, then, Supro guitars are back, relaunched in two ranges: the modernised solidbody Island series of three guitars, and the more expansive 10-strong semi-hollow Americana series, modelled directly after probably the most famous, if originally short-lived, of Valco’s designs – the Res-O-Glas models. Today, we’re running the rule over the Jamesport. The Indonesian-made Island series is straightforward with three models, all named after Long Island locations that are close to Absara Audio’s HQ in Port Jefferson, New York. They come in various colours and single- (Jamesport), double- (Westbury) and triple-pickup (Hampton) configurations. Their construction is identical, aside from a different pickup switch on the Westbury and the triple-pickup Hampton (three-way toggle and five-way lever respectively), and block fingerboard inlays compared with the dot inlays of the Jamesport. Based on an early 60s Spur Ozark with its well-known and distinctive single-cut outline, the Island models are certainly sharply made, although the opaque colours completely hide the 41mm deep alder slab body with its chamfered edges. The maple neck isn’t bolted to the body - as the wood combination and its Fender scale length would suggest - but is, in fact, glued in. That said, the full width of the neck slots into the body, which has a round-nosed comfortable heel. It’s more like a bolt-on joint, but without the screws. It might seem a pretty simple build, but the Jamesport has a few inherent tricks, one of which is the ‘wave’ tailpiece, “pulled from a 1962 National Westport guitar”, says Absara Audio’s main man, David Koltai. The second plus here is the placement of the single pickup, just a little south of a middle position, rather than directly in front of the bridge. And then there’s the actual Supro Gold Foil single-coil pickup itself that is humbucker-sized (handy if you want to retrofit something else) and mounted via a chromed ring to the body. The simple electronics mount to the three-ply scratchplate - which, here, is just a single 250kohm volume placed very close to the pickup and a 500k tone on the lower tip. Only the upper bass-side edge of the scratchplate looks a little unfinished and square edged, although, of course, on the other designs it’s cut away to surround the neck pickup. The side-mounted output jack sits on a neat chromed metal football plate: it really is a tidy job with a very working guitar feel about it. Despite a 9.16kohm DC reading from the Jamesport’s pickup - this is a single coil, remember - our amp stays clean and we’re met with a bright but not over-spiky single-coil voice that is less in your face, less direct-sounding or strident than any Fender references we listened to. Jangle it does and we’re reminded more of a Danelectro voice, although here it’s bigger: spiky yet smooth. There’s a really nice taper to the volume and tone knobs on the Island series’ controls. The Island series models have a contemporary feel about them and are slightly sharper in fine details (the fret-dressing, for example), in comparison to the Americanas, but we’re splitting hairs. Besides, Valco’s original guitars were never a head purchase, were they? They were about the heart, and these have both character and vibe in spades, not least in the sound department - a voice that, if not forgotten, is certainly overlooked, and extremely valid for the player looking back to the 60s to create different and new sounds.